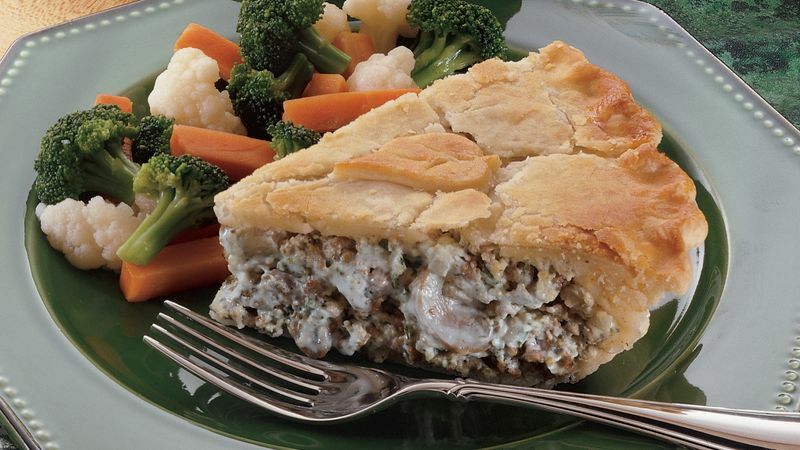 Make pie crusts as directed on box for Two-Crust Pie using 9-inch glass pie pan. Heat oven to 375°F. In 10-inch skillet, cook ground beef, onions and garlic over medium-high heat, stirring frequently, until beef is thoroughly cooked; drain. Stir in remaining ingredients except egg white. Pour into crust-lined pan. With leaf-shaped canape or cookie cutter, cut out leaf shapes in several places in second crust. Place over filling; flute crust edge. Brush with beaten egg white. Arrange leaf cutouts on top crust; brush with egg white. Bake 45 to 55 minutes or until crust is deep golden brown. After 15 to 20 minutes of baking, cover crust edge with strips of foil to prevent excessive browning. Cool 10 minutes before serving. * Cover edge of pie crust with strips of foil after 15 to 20 minutes of baking if necessary to prevent excessive browning.